Flash Gordon confuses me. Tremendously. In a way that rivals Microsoft Excel pivot tables, the critical acclaim of Citizen Kane, and the fact that Ghost-Rider with Nicolas Cage got a sequel. Or at least, Flash Gordon confused me before I read the gorgeously crafted Flash Gordon: The Tyrant of Mongo, the second volume of complete Flash Gordon stories from Titan Books. I’m finally starting to understand. He was definitely a baseball player, and I know this because Ken Griffey, Jr, N64. Flash was a nickname, his real name is Tom. He is in some way related to a Stephen King story, although why Stephen King would center a horror story on a relatively innocuous closer is beyond my capacity for understanding. None of this is really close to the truth, it’s merely coincidence, there is some alternate universe Flash Gordon that I’ve never encountered. I don’t think I’m the only one caught in the murky haze that is defining Flash Gordon. This example may be a bit extreme, but my brother told me recently that he sat down to watch Flash Gordon: The Movie thinking it was a movie about Flash Thompson. Ignoring for a moment the fact that my honestly-he’s-not-an-idiot brother thought there was a AN ENTIRE MOVIE DEDICATED TO SPIDER-MAN BULLY FLASH THOMPSON, I can empathize with the confusion. This Flash Gordon character belongs to an elusive, slippery mythos wrapped in a progression of flash-based copycats. His very existence has been muddled for years! He’s like the Sasquatch of non-Sasquatch-From-Alpha-Flight comics! This costume isn’t helping, Flash. Maybe try something a little less confusing? As Doug Murray’s insightful, engaging introduction of Flash Gordon: The Tyrant of Mongo makes clear, Flash Gordon is one of the most iconic, important comic book characters of all time. Although this particular volume catalogs the Flash Gordon strips (remember – this is the age of newspaper comic strips) from 1937-1941, the series was created in 1934 by artist Alex Raymond. Again, this clearly highlights my almost complete historical ignorance, but the fact that an enduring comic even existed before Captain America punched Hitler, and before Will Eisner’s Spirit changed the game forever, is mind-blowing. And yet, here it is – this entire, lush tale of space-traveling, tyranny-fighting Flash Gordon, a hero who looks a lot more like Aquaman than the mid-90’s Boston Red Sox reliever. Titan Books is quick to play up the George Lucas/Star Wars connection to Flash Gordon, and it’s not hard to see why. Who is this Flash Gordon Collection For? Titan Books has done a wonderful job with this collection of comic strips. It’s one of my singular favorite collections of a vast amount of material, possibly even ahead of Marvel’s The Mighty Thor Omnibus by Walter Simonson. Everything just feels right – the pages open and bend without fear of tearing the collection’s spine, the texture of each page matches the unique care and style of Alex Raymond’s art… the thing even smells good, like an afternoon immersed in a section of the library you just discovered. 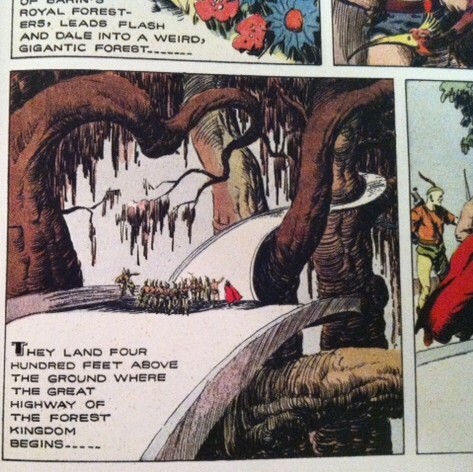 As far as the stories go, the real hero of Flash Gordon is Alex Raymond’s art. I’ll undoubtedly undersell the talent and skill of Raymond (there’s an entire book on the innovation of Raymond), but these pages are a blast to look at. As one might expect from an artist using live models in the 1930’s, his drawings are a beautiful change of pace from the digital sheen of modern comics. In a lot of ways, looking at these pages reminds me of how I feel now when I look at the art in a book like Mind MGMT – it is amazingly refreshing to experience comic book art that breaks away from the norm. In Raymond’s case, of course, this was inventiveness in its purest form. So it’s like a city… but in the trees. I won’t pretend I have much interest in avidly reading Flash Gordon’s adventures, though. I just can’t shake the weight of 80 years. Again, as a collector’s item I love this book. I also think it makes for a great coffee table book – I guarantee that if I throw this one down during a family reunion I’m going to get everyone from Uncles to toddlers enjoying the pictures. 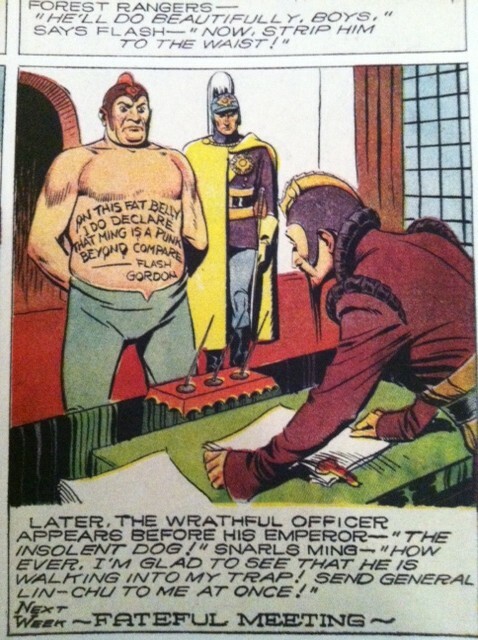 Ultimately that’s where I think Flash Gordon: The Tyrant of Mongo is at its most valuable. This is an important cultural artifact that showcases the importance of Alex Raymond’s contribution to comic books. 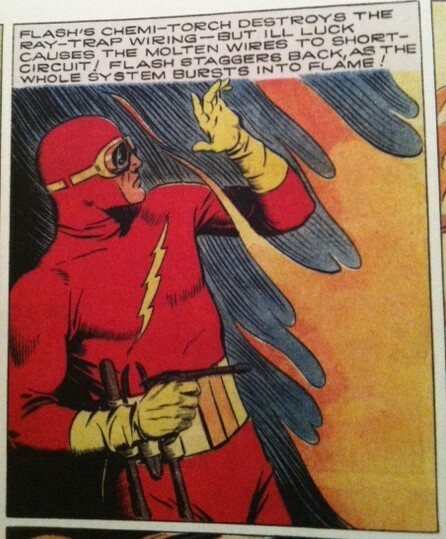 It shows just why Flash Gordon endures. Even if his name has been muddled and mangled by the years. Click here to purchase Flash Gordon: The Tyrant of Mongo from Titan Books.